Lost your manual? Can't figure out how to change the settings on your universal remote control? Too Many Remotes? Do you have to use more than one remote control to watch TV? Is there only one member of the family that knows how to operate the system? What happens when someone accidentally pushes the wrong button and suddenly the screen goes blank? Did a someone tell you that it would be easy? Did a retail store salesperson suggest buying a separate remote that could make it so? Is that remote control sitting on the coffee table next to all the others because it wasn't programmed or doesn't do the job you had hoped it would? 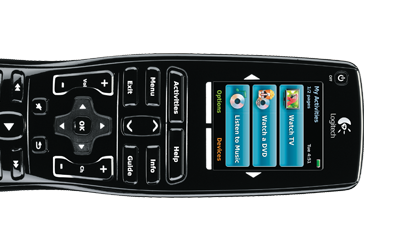 Dougwoody offers custom remote control programming services that will consolidate your Home Entertainment System remotes to one, workable remote that can be easily used by the whole family. Remote Control Programming is our business, and we can absolutely promise you that if you really want to solve this problem - then all you need to do is give us a call. We can help you eliminate the remote clutter in your home and return the control of your audio and video components back to you as it should be. This service is also available as part of our home theater, television or audio installation services and we guarantee our work completely.